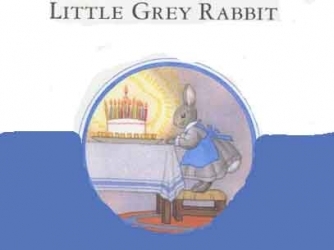 Little Grey Rabbit lives in a little house on the edge of a wood with her friends Hare and Squirrel. The house has no electricity or gas. Water does not come out of a tap, they fetch it from the brook and cook on a wood fire. They have many friends Moldy Warp the Mole, the Hedgehog Fuzzypeg, Wise Owl, Robin Postman, Water Rat, Badger & many others. Enemies include wicked weasel and hungry fox.